In 2006, 12.5 percent of all refugees were resettled in California. Foreign-born nationals can legally immigrate to the United States in three main ways: as a refugee or asylee, through employment, or through family reunification procedures. (See Spotlight on Legal Immigration to the United States). This month's Spotlight examines the data on persons admitted to the United States as refugees and those granted asylum in 2006. It also provides the number of refugees and asylees who received lawful permanent resident (LPR) status in 2006. The data come from the 2006 Annual Flow Report on Refugees and Asylees and the 2006 Annual Flow Report on U.S. Legal Permanent Residents, published by the Department of Homeland Security's Office of Immigration Statistics (OIS). We also used data from the Office of Refugee Resettlement, part of the Department of Health and Human Services. The annual ceiling for refugees admitted to the United States through the resettlement program has remained at 70,000 for the last five years. More than 41,000 refugees were admitted to the United States through the U.S. resettlement program during 2006. Nationals of Somalia, Russia, and Cuba accounted for almost half of all refugee arrivals in 2006. California and Minnesota resettled the largest numbers of refugees in 2006. About one-third of all refugee arrivals are principal applicants. More than 26,000 individuals (principals and their immediate family members) were granted asylum in 2006. China, Haiti, Colombia, and Venezuela accounted for half of all persons granted asylum in 2006. More than 216,000 refugees and asylees adjusted their status to LPR in 2006. Asylees accounted for more than half of all refugee/asylee LPR status adjusters in 2006. Refugees and asylees are similar in that they are aliens who are unable or unwilling to return to their country of origin or nationality because of persecution or a well-founded fear of persecution on account of their race, religion, nationality, membership in a social group, or political opinion. Refugees and asylees also differ in the way they are treated by immigration and refugee law at the time of application and admission (see sidebar). An asylum seeker present in the United States may submit an asylum request either with a United States Citizenship and Immigration Services (USCIS) asylum officer (affirmative request), or, if apprehended, with an immigration judge as part of a removal hearing (defensive request). During the interview, an asylum officer will determine whether the applicant meets the definition of a refugee. If the case is approved, asylees are authorized to work in the United States and are entitled to public aid benefits and a Social Security card. If the case is denied, an applicant may appeal for additional hearings with the Board of Immigration Appeals or, in some cases, with federal courts. Individuals may also request asylum at the port of entry (POE) by informing an inspection officer that he/she is fleeing persecution or seeking asylum. The individual is then referred to an asylum officer for a credible fear interview to determine if he/she has a verifiable fear of persecution. If the claim for asylum is verified, the case is referred to an immigration judge and the individual is placed in nonexpedited removal proceedings. If the claim is denied, the individual will be subject to removal. Refugees: Refugees receive permission to immigrate to the United States while they are still abroad. The State Department's Bureau for Population, Refugees, and Migration (PRM) contracts nongovernmental agencies, referred to as Overseas Processing Entities (OPE) to conduct prescreening interviews and prepare applications of prospective refugees. The applications are then submitted to U.S. Citizenship and Immigration Services (USCIS), which runs background checks, interviews individuals, and determines whether an individual is approved for resettlement. Once approved, a principal applicant, either alone or with his/her close family (spouses and unmarried children under the age of 21), is eligible to come to the United States through the refugee resettlement program. USCIS collects data on refugees three times: when their applications are submitted abroad through OPE or the UN High Commissioner for Refugees (UNHCR), when they arrive in the United States for resettlement, and when they adjust their status to LPR. Refugees resettled in the United States are automatically eligible to work and to receive public aid cash assistance and medical assistance for up to eight months as an individual and up to five years as a family. Asylees: According to the U.S. Refugee Act of 1980 and based on the 1951 UN Refugee Convention, any alien who is physically present in the country or at a port of entry may apply for asylum, regardless if his or her current immigration status. Asylum is granted after an individual's application has been processed and approved (see Asylee Data below). A person who was granted asylum is entitled to a Social Security card, employment authorization, and other assistance. Annual limits on admission: Each fiscal year, the president determines the number of refugees to be admitted to the U.S. Refugee Resettlement Program. No such cap exists, however, on the number of asylum applications or approvals for asylum. As lawful permanent residents, refugees and asylees have the right to own property, attend public schools, join certain branches of the Armed Forces, travel internationally without a visa, and, if certain requirements are met, apply for U.S. citizenship. Up until 2005, there was a 10,000 annual limit on the number of asylees who were authorized to adjust their status to LPR. The implementation of the Real ID Act eliminated that cap in 2005. No annual limit has ever or currently exists on the number of refugees eligible to adjust to LPR. The admission ceiling for refugees declined 70 percent from 231,700 in 1980, when it was first introduced, to 70,000 in 2002 (see Figure 1). It did not change between 2002 and 2006. The number of persons who may be admitted to the United States as refugees each year is established by the president in consultation with Congress. At the beginning of each fiscal year (during the month of October), the president sets the number of refugees to be accepted from six global regions, as well as an “unallocated reserve” if a country goes to war or more refugees need to be admitted regionally. In the case of an unforeseen emergency, the total and regional allocations may be adjusted (see Spotlight on the U.S. Refugee Program). The ceiling for each region in 2006: 20,000 from Africa, 15,000 from East Asia, 15,000 from Europe and Central Asia, 5,000 from Latin America and the Caribbean, and 5,000 from Near East and South Asia; 10,000 were unallocated. 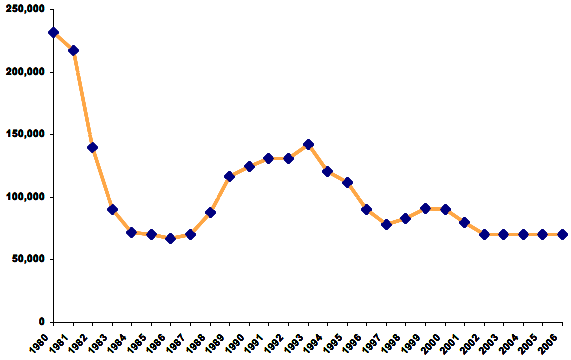 Figure Source: U.S. Department of State, Bureau of Population, Refugees and Migration. More than 41,000 refugees were admitted to the United States through the resettlement program during 2006. In 2006, 41,150 individuals were admitted to the United States as refugees. This figure represented a 23.0 percent decrease compared to the corresponding number in 2005 (53,738) and a 22.1 percent decrease compared to the number in 2004 (52,837) (see Figure 2). Source: 2006 Yearbook of Immigration Statistics and 2006 Annual Flow Report on Refugees and Asylees. Nationals of Somalia, Russia, and Cuba represented 19,503 persons, or 47.4 percent, of all refugee admissions in 2006 (see Table 1). Altogether, nationals of the top 10 countries made up 84.9 percent of the 41,150 refugee arrivals in 2006. In addition to the top three, these countries include Vietnam, Iran, Ukraine, Liberia, Sudan, Burma, and Ethiopia. According to the Office of Refugee Resettlement, 31.2 percent of refugees (3,227) from Somalia were resettled in Minnesota in 2006. Thirty-six percent of refugees from Russia, Ukraine, and other republics that once were part of the Soviet Union (3,735) were resettled in Washington, California, and New York. In the same year, 62.4 percent of refugees from Cuba (1,961) were resettled in Florida (see Figures 3.1 to Figure 3.3). 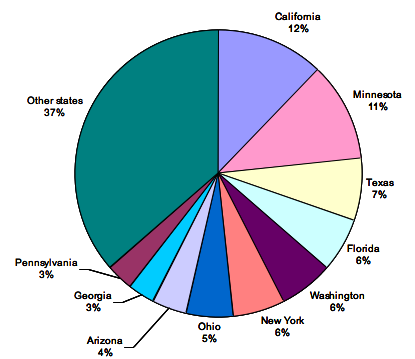 In 2006, the largest percentages of refugees admitted to the United States were resettled in California (12.5 percent or 5,163) and Minnesota (11.1 percent or 4,578). Large numbers of refugees also were resettled in Texas (6.7 percent or 2,764), Florida (6.3 percent or 2,582), Washington (6.0 percent or 2,458), and New York (5.6 percent or 2,303). Almost half of all refugees were resettled in one of these six states (see Figure 4). The 2006 Office of Refugee Resettlement data indicate that 32.1 percent (1,655) of refugees resettled to California in 2006 were from Iran while 26.7 percent (1,376) were from the former Soviet Union. Of those resettled to Minnesota, 70.5 percent (3,227) were from Somalia. In Texas, refugees from Somalia accounted for the largest share — 17.0 percent (471) of all resettled refugees (see Figures 5.1 to 5.3). Who is a Principal Applicant? Principal Applicant: When interviewing family units, all adults are interviewed. Only one member of the family unit, however, needs to meet the U.S. refugee definition (this person is often referred to as the principal applicant). Other members of the same family may derive refugee status from the principal applicant. Thirty-six percent (14,961) of all refugees admitted in 2006 were principal applicants (see sidebar for detailed explanation). They were accompanied by dependent children (45.6 percent or 18,711) and spouses (14.7 percent or 6,055). Other dependents (e.g., parents and siblings) accounted for the remaining 3.5 percent (1,423). In 2006, 26,113 principals and their immediate family members were granted asylum. This represents a 4 percent increase over the corresponding number in 2005 (25,160) and a 4 percent decline compared to the 2004 number (27,218). Of the 26,113 asylees, 49 percent (12,873) were granted asylum affirmatively and 50.7 percent (13,240) were granted asylum defensively. More than 5,500 nationals of the People's Republic of China, 3,001 nationals of Haiti, 2,964 nationals of Colombia, and 1,359 nationals of Venezuela were granted asylum, accounting for 49.4 percent of all individuals who received asylum status in 2006 (see Table 2). In 2006, 216,454 refugees and asylees adjusted their status to LPR, a 51.4 percent increase over the number in 2005 (142,962) (see Figure 6). 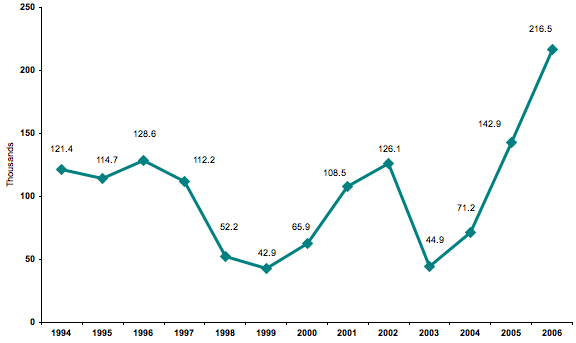 Source: 2006 Yearbook of Immigration Statistics and 2006 Annual Flow Report on U.S. Legal Permanent Residents. Asylees accounted for more than half of all refugee/asylee LPR status adjusters in 2006. Of the 216,454 refugees and asylees who adjusted their status to LPR in 2006, 116,845 (54.0 percent) were asylees and 99,609 were refugees (46.0 percent). The asylee number was nearly four times the number in 2005 (30,286) while the refugee adjustment number decreased 11.5 percent from 2005 (112,676). The Annual Flow Report on Refugees and Asylees: 2006. Available online. The Annual Flow Report on U.S. Legal Permanent Residents: 2006. Available online. Kelly O'Donnell is currently an Interagency Specialist at USAID/OFDA.